We pause from this week’s 1948 historical retrospective for: A product recommendation! I am letting a little secret out of the bag, readers: J.C.Penney is a great store (and catalog and website) for many things retro. As in: If it’s a place grandma would shop for home decor – we like it! J.C.P., wanna advertise on the blog? It really truly is a good fit! I love these curlicue bath rugs, for example. 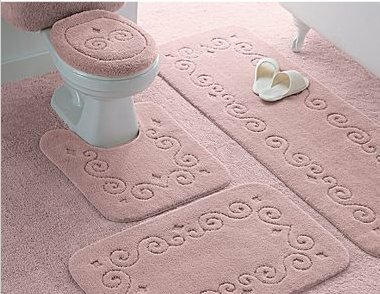 They are very vintage looking… I really prefer the latex back so that the rugs are “sticky” to the floor… You can get matchy-matchy pieces for everything including the all-important toilet cover!… And they come in a number of colors including ta da pink blush. You know, I also like the fact that they come in large 5×8 and 6×9 sizes. Don’t we all remember putting those down in the winter – after cutting them to fit our bathrooms perfectly? Yes, they get disgusting – but only if you don’t wash them. There are a variety of other rug sets available at J.C.Penney, and bath towels, too. And of course, there’s always The Greatest Two Day Sale EVER going on….! I love jcp! For housewares and cute, inexpensive clothing. These rugs are adorable! Their “Lisette” sheer curtains are pretty, too. I have their “aqua dust” panels in our tropical rec room. Thanks Pam! Just got them ordered. My new white floors were looking very cold. This is the perfect solution! Always a step ahead w/ the little details that finish a room off. What color did you order, Nancy? Pam- I got the Willow Green & think it will really warm up the bathroom w/ a good 50’s feel.